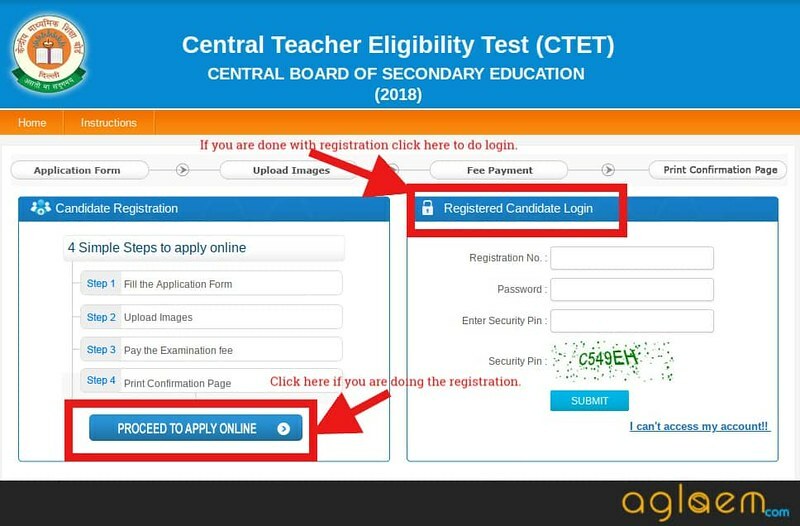 Central Board of Secondary Education (CBSE) has reopened the CTET 2018 Application Form portal at ctet.nic.in for the candidates who could not submit their application fee before the due date. 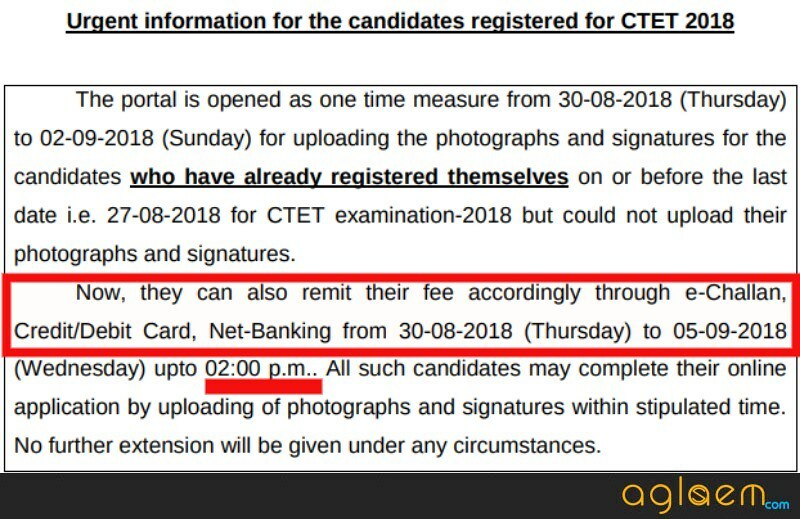 Those who are already registered for CTET 2018 are able to remit application fee till September 05, 2018. The application fee could be submitted up to August 30, 2018, before 03:30 PM. Candidates will able to make a correction in application fee from September 06 to 15, 2018. A General category candidate has to pay Rs. 700/- for one paper, for Paper I and II the fee is Rs. 1200/-. In the same way, the reserved category candidate has to pay just half of the general category i. e. Rs. 350/– for one paper for both paper the candidate have to pay Rs. 600/-. CTET 2018 will be held on December 09, 2018. To know the CTET 2018 registration fee, modification details, etc, keep on reading the article. Latest: CBSE has reopened the portal for the candidates to remit the application fee till September 05, 2018. Scroll down to check the same. As application form filling period has been over, candidates cannot apply for this year now. The candidates can correct their form according to the correction period given here. Check all important dates from here. Apply Online: Click here to upload photo and signature in CTET 2018 Application Form. The CTET application fee amount varies as per the category and paper. The application fee for CTET 2018 is as mentioned below. Note: Pay attention while filling CTET 2018 Application Form because Application Fee will not be refunded if there will be any mistake on the CTET 2018 Application Form. 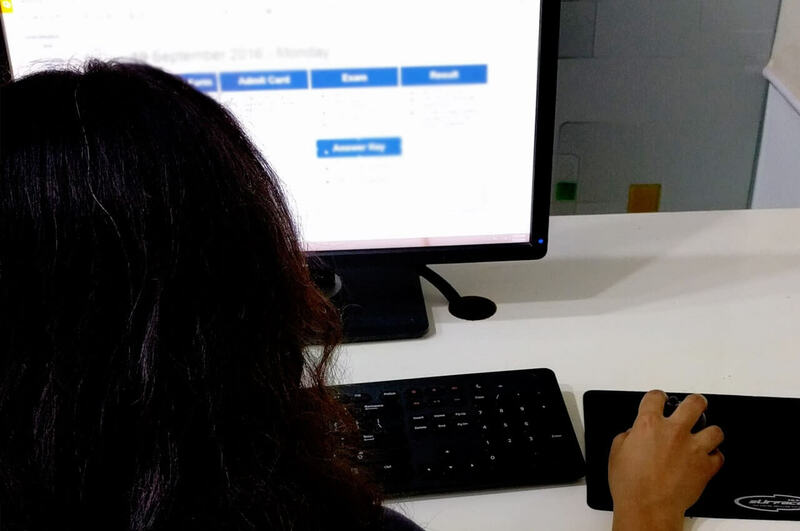 While filling the CTET 2018 Application Form 2018 the candidates have to attach some sort of documents, and some other have to be attached to it. The list of all essential documents is available here. Credit Card / Debit card details if submitting the online fee. Scanned copy of photograph in jpg format of 10 to 100 KB with dimension 3.5 cm (width) x 4.5 cm (height). Scanned copy of the signature of 3 to 30 KB of with dimension 3.5 cm (length) x 1.5 cm (height). How to Fill CTET 2018 Application Form? Before applying for CTET 2018 you are advised to check the eligibility criteria. If you are in CTET 2018 then you can refer to the points below to fill the CTET 2018 Application Form online. Step-1 Click on the link of CTET 2018 Application Form: First of all click on the above link which redirects you to the page shown below. Now if you are a new user then you have to click on the button “Proceed to Apply Online”. Then some instructions will be displayed on your screen. Read all the instructions carefully and then click on the “Proceed” button. 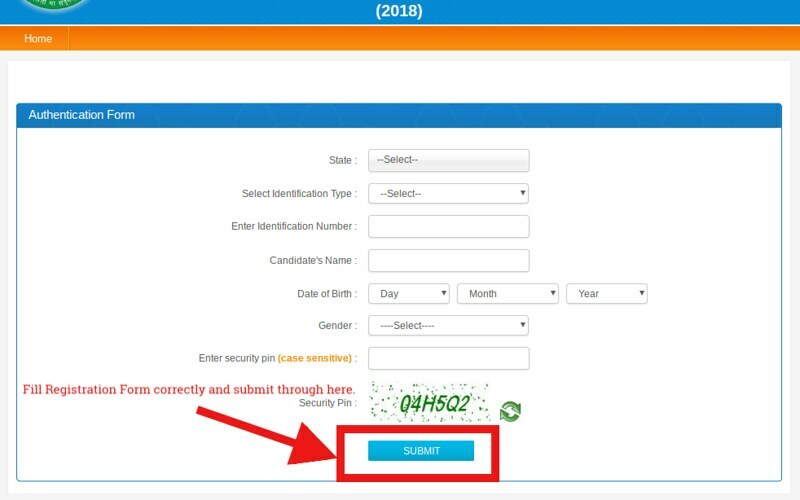 Step-2 Registration of CTET 2018 Application Form: After following the above steps the new page opens, which will ask for State Name, Identification Number and type (such as Aadhaar card, Driving Licence, Passport etc. ), Name, Gender. After filling all the fields correctly candidates have to submit the form. Exam Centre Preference: You get three preferences to fill the exam center. The center will be allotted to you according to the candidates. Have you Appeared for CTET before? When you select the Exam, you will get some options to mark the educational qualification. Choose your relevant option. At last, enter the Security PIN and then click on “Next” button. Step-4 Review Page of CTET 2018 Application Form: After filling in the details, you will get a review page. Check all the details carefully and then click on the “Final Submit” button. Step-5 Upload Images in CTET 2018 Application Form: Now you have to upload the images such as photograph and signature in the specified format. The specifications are given below. Step-6 Application Current Status for CTET 2018 Application Form: After uploading the images a status page will be displayed. On the screen, you will get the Registration Number. Then select the Mode of Payment. Step-7 Fee Payment for CTET 2018 Application Form: Now you will need to pay the application fee as specified above. Step-8 Downloading Confirmation Page from CTET 2018 Application Form: After the payment, a confirmation page will be displayed. Take the printout of that confirmation page for the future reference. What to do if Unable to Generate the Confirmation Page? Generally, on successful application, Confirmation Page generates automatically. But, sometimes due to technical inferiority, the candidate is unable to fetch the confirmation page of the successful application. In this case, a candidate should approach the Assistant Secretary, Examination, CTET Unit, CBSE between 10:00 A.M. to 5:00 P.M form August 30 to September 04, 2018. The candidate should have the proof of the payment of fee either through Bank Challan or through Credit/Debit Card for considering his/her candidature for CTET – 2018. Candidates should report to the CBSE from 23 to 27 July 2018. You should pay extra attention at the time of filling the CTET 2018 Application Form then finally submit the form. But if there will be errors in the CTET 2018 Application Form, you will get the chance to make corrections in the form. You will be allowed to make changes in name, father and mother Name, Date of birth, Category, Differently abled category, Paper opted, Subject for Paper – II, First choice of Centre, Language I and/or II opted, Address of correspondence and the name of the Institution/College/University from where he/she has obtained his/her B.Ed Degree/Diploma in Elementary Education etc. The changes will be done in online mode only. Corrections will not be accepted through fax/application or by email etc. Ques: Is there any limitation on attempts to appear for CTET? If yes then how many attempts are allowed? Ans: No, as of now, there is no limitation on a number of attempts. A candidate can appear in CTET as he/she wish. Ques: The amount has been debited from my account, but the confirmation page is not generated. What should I do now? Ans: This could be the problem of traffic or congestion of the network, the fee is deducted from the bank, but not credited n the board account. In this case, the candidate has to pay again with the available mode. In 10 to 15 working days, the deducted amount will be refunded. Ques: I made mistake in my father’s name while filling the CTET 2018 Application Form. What should I do now? Ans: Do not worry, you will get the chance to correct the CTET 2018 Application Form as per the schedule provided by the CBSE. Ques: Can I appear in both paper of CTET in different cycles? Ques: I had already qualified CTET. Can I appear again in CTET? Ans: Yes, CTET has no restriction. hi.In ctet form status of qualifing exam meaning? i filled passed. now i hv confusion in this.Pls clarify it..